Zimbabweans possessing quadrillions in “Zim dollars”, the country’s severely inflated currency, now have the opportunity to exchange their virtually worthless money for U.S. dollars at a new exchange rate. The rate? 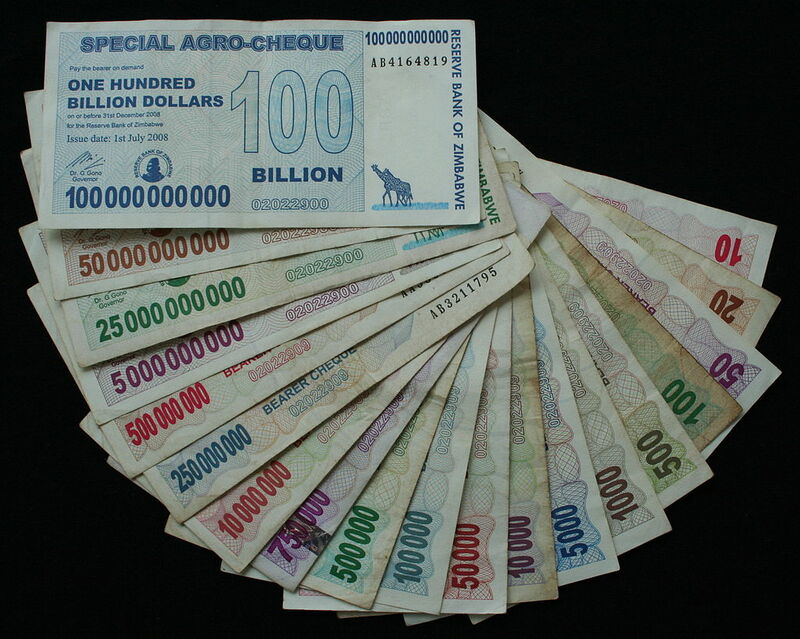 35,000,000,000,000,000 (35 quadrillion) Zim dollars per $1 USD. The new exchange rate is part of an effort by Zimbabwe’s President Robert Mugabe to rid the country of its hyperinflated currency. Zim dollars remain in circulation, but have fallen out of favor since 2009 with foreign currencies being used instead. Customers who held Zim dollars in a bank account before March 2009 may now convert their balance to U.S. dollars, Reserve Bank of Zimbabwe governor John Mangudya said in a statement Monday. Account holders have until September to do so. Those with balances of up to 175 quadrillion Zim dollars will receive $5 USD, and those with balances above 175 quadrillion will be paid at the new exchange rate. Zimbabwe’s infamous hyperinflation began in the late 1990s when President Robert Mugabe’s government expropriated private farms owned by white Zimbabweans and redistributed the land among the country’s majority black population. The land reform measures were followed by a long period of decline in farm and manufacturing output as well as high unemployment, a collapse of the banking sector, and even famine. In addition, the Mugabe government printed money to fund Zimbabwe’s involvement in the First and Second Congo Wars and to pay army and government officials’ salaries. Zimbabweans quickly lost faith in their government and the value of their currency. By 2003 the inflation rate had reached 598.75%, and by mid-November 2008 it had reached a staggering 89,700,000,000,000,000,000,000% (89.7 sextillion percent). Zimbabwe officially stopped printing its currency in 2009, although the citizenry had been using foreign currencies for years. Zimbabwe’s hyperinflation was the second most severe one in history, behind Hungary’s hyperinflation of 1945-46. Read about other hyperinflation episodes in our post Inflation gone wild: The 5 most extreme cases of hyperinflation. The highest Zim dollar denomination ever printed was 100 trillion (pictured above). In November 2008, at the peak of the crisis, prices would rise twice or more within a day. Zimbabweans often needed to carry plastic bags full of Zim dollars just to buy basic goods. In 2006, a roll of toilet paper cost $145,750 Zim dollars. 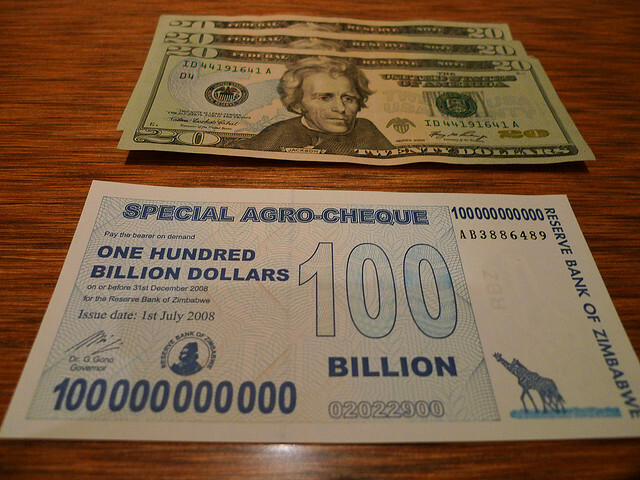 100 trillion dollar Zimbabwean banknotes are now sold as souvenirs to tourists for about $5 USD. They are also popular among currency collectors. How could everyone be a quadrillionaire, yet no one is rich? One reason: inflation. Reckless money printing has dire consequences – in Zimbabwe, it led to a complete collapse of the national currency. But guess what governments can’t print? Gold. Currencies can collapse, but gold will always be gold. It’s no wonder so many people own gold as a hedge against inflation and to protect their purchasing power. While a hyperinflation episode like Zimbabwe’s is extremely unlikely to happen in America, the threat of inflation is always there. Call American Bullion today at 1-800-326-9598 to speak with a precious metals broker about purchasing physical gold and silver for your IRA or direct delivery.